Step one you’ve got covered: a treasure trove of exotic liquors and bathtub bitters. 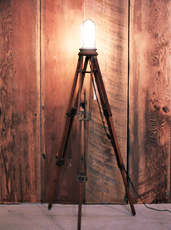 Step two: dress up your place in the of-the-moment look of reclaimed wood and vintage American industrial fixtures. For that, we turn to Union Wood Company, a new online concern out of Canada (yes, that’s right) committed to American vintage and one-of-a-kind pieces made from salvaged wood. First things first: you’re going to need somewhere for people to sit. So start out with a set of their specialty: welded steel and wood lab stools. And should you feel that your granite countertop isn’t setting the right mood, you can commission just about anything from them, up to and including a salvaged wood bar. That out of the way, you can turn your attention to filling the place with picker-worthy antiques like a 1920s honor roll chalkboard from a Freemason’s lodge (useful for your drink list), a Civil War supply crate (bottle storage) and 1940s-era trophies (for your living-room darts league). You can even pick up an apron made from vintage Army canvas and a big maritime spotlight. Comes in handy around last call.